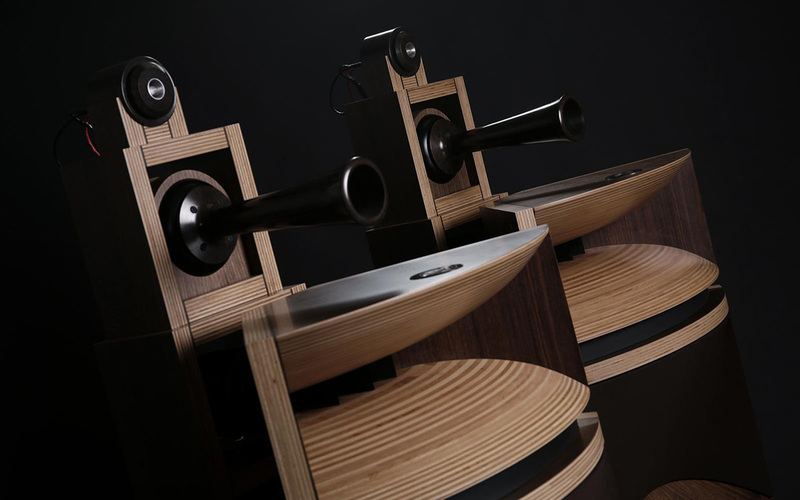 With a name like ppfff, this new French speaker brand would play perfect stand-in for those annual four days in May when Munich—Monaco in Italian sadly without the Med—becomes host to the international hifi scene for the industry and public alike. Far too big to comprehensively cover by oneself, one cherry-picks from those rooms or stands which strike one with fff or forte fortissimo to overlook or pass those by which tickle one's inner tuning fork with barely a pp or pianissimo. That playing as loud as possible has on me at least the exact opposite effect from what's intended is one of those many délicieux sortilèges or devilish spells of all such events. To spend quality time with anyone by necessity means spending no time with others. Where I'd stop and feel triggered would, as usual, be up to chance. Also as per usual, I'd have a list of go-see destinations. Without further explanations, here are those which I knew about before packing my bags. 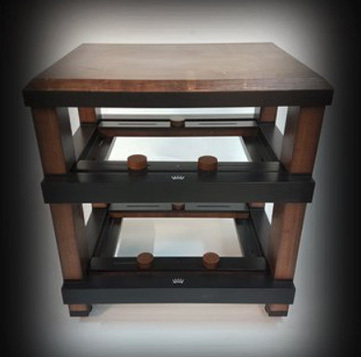 Spanish Artesania Audio, makers of our Exoteryc audio equipment rack, would show their new The Absolute Rack [below]. Certain details suggested that Cliff Ormand of Vibex and contributor to Spanish speaker brand Kroma might have had some input. Zoltán Bay's new Bayz Audio Courante speakers were a de rigueur stop. The team behind it includes Frank Nielsen of Danesian Audio ApS aka the designer of SB Acoustics' top Satori drivers; and András Voloscsuk of Composite Project Kft. who for decades now "has developed new carbon-fibre materials for F1 monocoque cars, Red Bull Air Race World Championship planes, even carbon fiber pianos." From Courante's spec sheet one learns of a "proprietary and patented feather-weight electrostat-like tweeter membrane with no breakup modes and omnidirectional dispersion past 20kHz; a proprietary woofer with Egyptian papyrus cone; a carbon-fibre non-turbulent ultra-stiff/light cab; a solid granite base; 28Hz-22kHz bandwidth; 90dB sensitivity; and 4Ω impedance". Designed in Hungary, built/tested in Danesian's Danish facilities, the Bayz Audio Courante had must-hear written all over it. With Fyne Audio the inheritors of core Tannoy personnel after that legendary Scottish company sold to the pro-oriented Music Group in 2015 as part of the Danish TC Group of companies, I was curious how Scottish dual-concentric driver tech had migrated to its new home. Having called Kii Audio's Three speaker the 'most intelligent monitor made' in my review of a year ago, I now had to check out their newest 8-woofer/ea. BXT bass augmentation bases which likely transform the monitors already good to 20Hz for small rooms and lower SPL into good-to-20Hz beasts for big rooms and higher volumes. Those last 10 cycles are bloody demanding fellas, aren't they? Cube Audio from Poland were bound to show their flagship F8 Magus; perhaps even an early model with their forthcoming big 10" widebander. I had reviewed their Bliss C model and thought it a Voxativ competitor for a lot less money. Checking in on their latest was mandatory. To up their Berlin ante for a 10th anniversary, Voxativ announced their all-new Ampeggio X [$45'000/pr with top driver and linear power supply] for which "the most significant change is that it can now accommodate our flagship field-coil drivers. To accomplish this, our fully Acoustic Stealth Technology tuned cabinet has been retooled to accommodate the size and scope of these full-range reference level drivers." In-house accompaniment can now be their new T805 SET [$27'900], a 30wpc reference tube integrated whose noise floor is sufficiently low to be inaudible over these 100dB speakers. 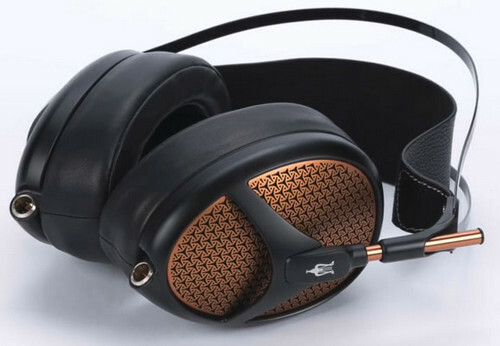 Hopefully MrSpeakers' new electrostatic Voce headphones could be sampled in their outlier Marriott display and Meze's flagship Empyrean planar in theirs at the M.O.C. which last year they'd already talk-teased [right]. On the headfi subject, 2017's launch of Final's D8000 planars had me wonder what this ambitious Japanese specialty boutique would show this year. Anyone into uncompromised sound which isn't tainted by unpredictable room interactions, LF speaker limitations or the effects of noise pollution on neighbours and co-dwellers would be foolish not to investigate then invest into a top-notch headphone system. It also means significantly less outlay than a speaker system of theoretically equivalent quality. As makers of one of my favourite headphone DAC/amps, I obviously had to look at what COS Engineering from Taiwan would bring to the show. Slovakia's Stark speakers have always impressed me with uniquely elegant form factors so it was time that I sat down and actually listened in for a bit. With Æquo Audio's new Stilla show pair bound for Ireland afterwards, my visit to the Dutch room would be mostly to talk to Ivo & Paul. I was curious whether they'd preview a mockup of their forthcoming passive Gladium model. Nagra of Switzerland would likely show the new multi-source external power supply based on the ultracap concept already exploited in their take-no-prisoners HD Preamp. Metrum Acoustic's €399 Flint mini DAC might cross my path somewhere. Having missed out to listen to a Spatial Audio open-baffle speaker last year because I'd gotten sidetracked by the Zu Audio Druid VI demo in the same exhibit, I wanted to repent if the opportunity arose. Which reminds me of an Irish joke. "Is that the Westport Echo?" asks Seamus. "Yes," replies the publisher's secretary. "How much would it be to put an ad on your site?" "Five pounds an inch. Why? What are you selling?" "A 10-foot ladder," says Seamus before he slams the phone down. Experienced showgoers know not to expect magic or any sonically sure things in temporary facilities; with equipment that might have been finished a day before or was never tested with those exact ancillaries in the first place; in any seat other than the lone perfect spot; with music one hates; with everyone sucking on the same polluted AC; with people talking; with SPL too high for comfort. Just so, for three years running, the Living Voice demos had been perfectly reliable sure things, sonic highlights and personal yardstick for what's possible when an ambitious team takes full control over all the variables*. For 2018, the Brits would have two big systems. "Not wishing to make life too easy we have decided to show both Vox Olympian & Vox Elysian and Vox Palladian & Palladian Basso systems this year. Two rooms, two systems, in E220 and F219. In E220 we have the Vox Olympian & Vox Elysian partnered with vintage Kondo electronics with both digital and analogue sources. For analogue we have the delightful and understated Grand Prix Audio Monaco 2.0 turntable with a Kuzma 4-point tonearm, and either a Fuuga or an Io-M cartridge, and SJS model 3 phono stage. The digital source will be our high octane LV CD300 player based on the Canary machine and we will also be playing our classic Living Voice OBX-RW3 throughout the show. "In F219 we have the Vox Palladian & Palladian Basso partnered with an Engstrom Monica line preamp and Lars mono power amps. The new Engstrom Arne integrated amplifier will make its first public outing with a pair of Living Voice OBX-RW3 loudspeakers. For analogue we have the Kuzma-M turntable with a Stogi S VTA tonearm, Fuuga cartridge and an SJS model 3 phono stage in a matching walnut livery. The digital source is our trusted giant killer LV CD300 player. No frills, just pure performance. Munich 2018 will also see the first outing of the new Living Voice G2 equipment supports in both rooms. The G2 is a performance focused design that combines clean simple lines with innovative resonance control. 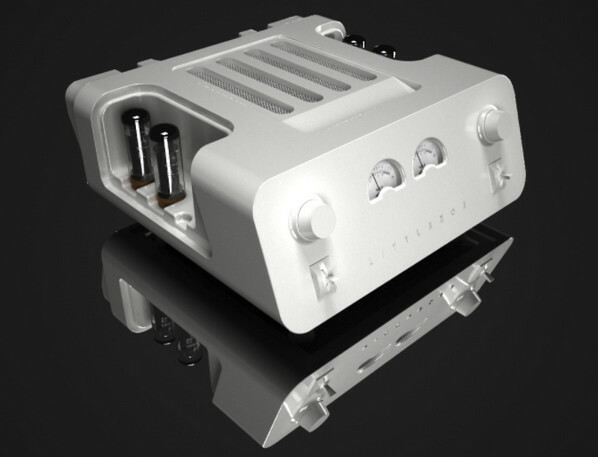 Once again the power supply duties will be delivered by the Living Voice Pure Music battery power supply system, allowing us to cruise off-grid all day in both rooms." Another reliable sonic destination had always been Kaiser Acoustics who this year would bow their new Furioso Mini, a hot-rodded Chiara for less money which also was due for an immediate post-show review. I'd look up LinnenberG, makers of some of my favourite wide-bandwidth amps; Pass Labs; Audio Physic; Gryphon; and all the usual subjects whose samples factor in my personal hardware library or are perennial review favourites. Given how expensive attendance can be or how booking mistakes can cost a company a regular room—S.P.E.C. of Japan this year lost theirs and couldn't secure a replacement—not everyone makes Munich. New brands like Lithuania's 8mm audiolabs prefer Warsaw where a splash is 1/5th the cost. Lucky newbies like this year's LitteZoe [left] win one of the hotly contested free Newcomer spots whilst last year's newcomer B.audio would this year man their own paid-for stand. Others opt for the cheaper parallel Hifi Deluxe venue at the Marriott whose 20:00 closing adds two hours to the M.O.C's 18:00, giving their visitors those strategic extra two hours to change places. To actually meet some of one's personal heroes can be much harder. Many are constantly booked for dealer/distributor meets and not at their official display. As reviewers, it's unfair then to text them away for some frivolous chit-chat when they could instead write actual much needed business. It's why some firms prefer to make firm press appointments. Those let their PR personnel reserve specific times to meet specific reviewers. Then there are closed-door reveals or guided demoes which also mean that you must be at a particular place at a particular time to get in. That's not for commitment-phobic Moltebanos. Given my improvisational approach to walking the show beat to allow for impromptu diversions aka the human element, I never commit to timed meets. I never know where I'm going to be just then. I prefer to get there when I get there. That plays it by ear not an appointment book which I don't own in the first place. If you're a reader who wants a few words, don't hesitate to walk right up. My wife tells me I'm far nicer than I look and all bark, no bite. So do stop me in my tracks. It'll be a nice break from all that hardware. Just don't ask whether I've heard anything promising. Chances are I'm already suffering sensory-overload brain numbness by then. Plus we all know that reviewers are deaf.